Established in 2003 by Lee C. Bollinger, the World Leaders Forum is a year-long itinerant event in which leaders from all different regions of the world explore the main economic, political and social issues of the day. 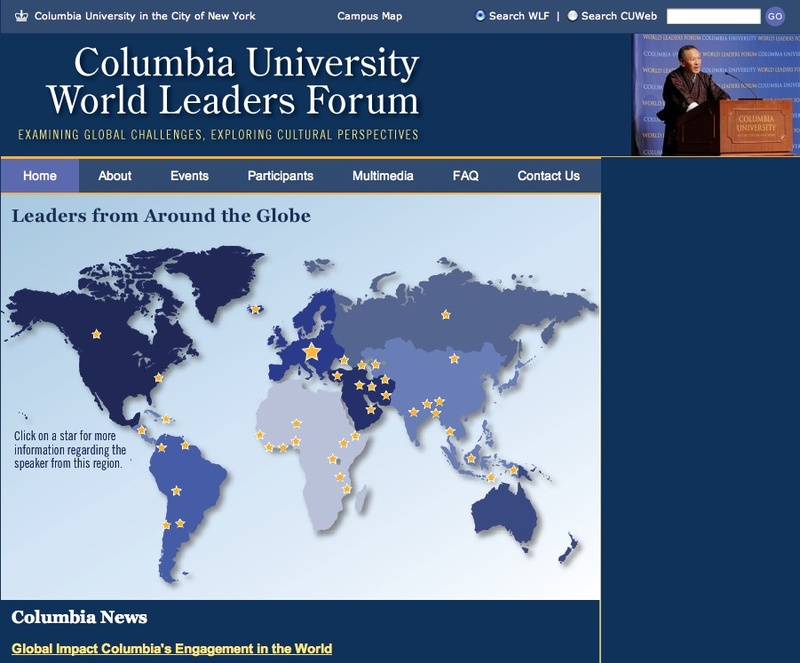 Several global leaders – such as the Presidents Nicolas Sarkozy of France, Vladimir Putin of Russia and Michelle Bachelet of Chile, or the Dalai Lama – have taken part in this Colombia University project and their contributions cover a wide range of topics. The lectures are classified by personality, academic year, event and participant origin (with a world map to aid location). The events page includes a brief introduction to each event as well as links to the actual videos on youtube, as many cannot be viewed directly on the site. The site does not provide background information to the lecture nor biodata about the lecturer, nor are there any sharing or feedback tools. However, the straightforward structure of the site allows for easy access to the content and the site is updated as soon as new lectures are given.